We're back after a little hiatus of our flashback series. Ask yourself this question: What first comes to mind when thinking of a themed issue of a fashion magazine? Vogue Italia's controversial, yet powerfully stunning, 'A Black Issue'? Correct. I can vividly remember the mass of buzz circulating the forums regarding this issue of Italian Vogue. I hadn't taken much notice of Franca Sozzani's Vogue until I had become interested in this particular hotly-debated issue featuring only black models, photographed by Steven Meisel. After a thread of almost 800 comments had spawned within the forum, I was becoming increasingly transfixed on this historic edition. Naturally, I rushed out to the store to make a purchase and came home with Naomi Campbell's cover. My local store had all four covers (Liya Kebede, Jourdan Dunn, Sessilee Lopez and Noami Campbell), although what was I going to do with four covers of the same issue? I left the store with Noami's in hand and thought I would let other customers have their pick of the others (a sorry mistake after realizing how much the issue would later retail for online). The contents of this 346-page issue are a sheer delight. 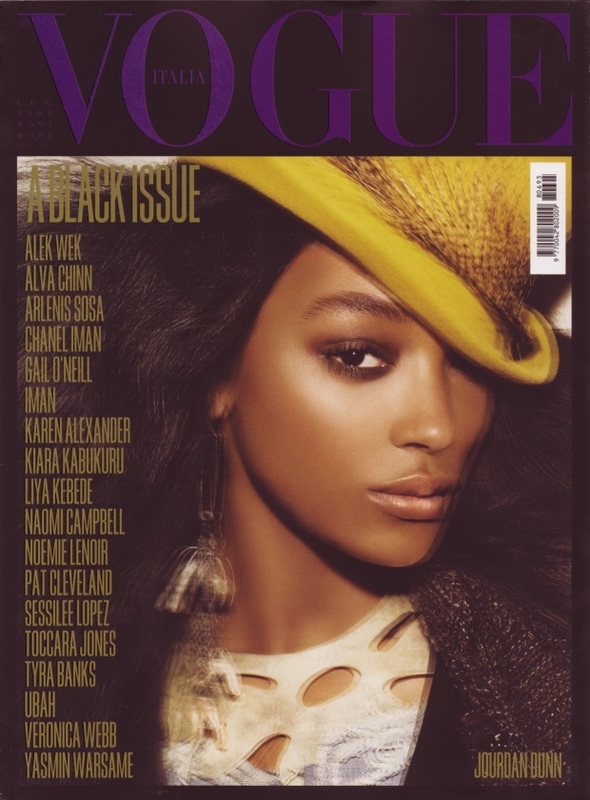 Italian Vogue regular Steven Meisel photographed six stories with the likes of Naomi Campbell, Tyra Banks, Toccara Jones, Yasmin Warsame and Sessilee Lopez, to name only just a few. My favorite story from the entire issue is 'How to Dazzle' which was shot by Meisel and features American model Sessilee Lopez. The black and white images consist of a fierce and ruthless-looking Lopez shot in the studio and wearing creations from fashion houses such as Louis Vuitton, Lanvin, Dolce & Gabbana and Yves Saint Laurent. Which cover did you get for yourself? Are you still on the hunt? You can familiarize yourself with the content and lose yourself amongst the two threads here.